We have added some fun new card games to our collection! 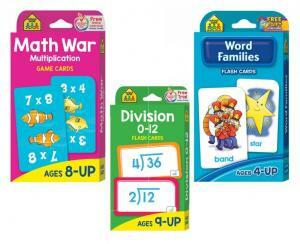 Math War: division, multiplication, and addition/subtraction game cards are an excellent way to improve math skills while also having fun. Plus, we have animal matching, word families, and silly sentences card games! Ages vary, starting at 4 and up. These card games are available at our Educational Resource Center. Olympic Time is Time to Move! 2018 marks the 10th year of the Giant Puppet Project at Mountainside Elementary School (MES) on Fort Carson. Concrete Couch works with the students to design and build a marionette puppet that is based on a favorite children's book. 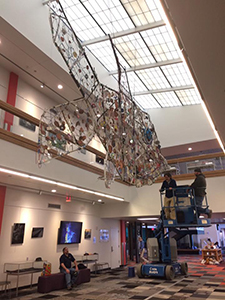 The most recent project, inspired by The Rainbow Fish by Marcus Pfister, is now installed at Library 21c. The project involves kids from military families, their parents and siblings, and community volunteers. 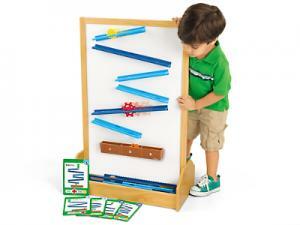 It is designed to boost literacy skills, has a pre-engineering element, and is just plain fun! Kids ages 6 - 10 are involved in the 11-day experience. The installations are up at MES for one year, and each puppet has about eight different moving parts! For the installation at Library 21c, Rainbow Fish was simplified to be a non-moving sculptural piece. Sponsors of the program include the Bee Vradenburg Foundation, Joseph Henry Edmondson, El Pomar and Quail Roost Foundations, the Hillsdale and Alpenglow Funds, Colorado Industrial Recyclers, the Habitat for Humanity ReStore, and Barb and David Winter. Special thanks go to the many volunteers who assist in this and other Concrete Couch projects. You guys are the bomb! 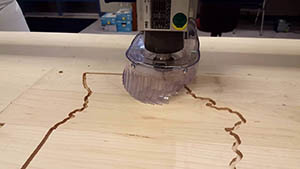 Design your own roller coaster with our new Engineer A Coaster Kit! Through trial and error, kids learn how the track position will affect the disk as it rolls and travels from track-to-track and into the goal box! This kit is ideal for developing skills in understanding speed and momentum, force and motion, angles and trajectories, and size. For ages 3 and up. This kit is available at our Educational Resource Center. Percy Jackson fans rejoice! There’s a new hero in town and a new mythology to explore in Aru Shah and the End of Time. Aru Shah’s tendency to stretch the truth has landed her in some hot water after she lights a cursed lamp and sets things in motion that will be difficult to undo. Chokshi’s new series is part of a new imprint of titles handpicked by Rick Riordan himself. After Bad Whiskey burns down his home, Keech finds himself on the path of finding the Char Stone, a legendary stone of massive power. Can he and a band of orphans outlast against undead outlaws, and find the stone? A journey to find her grandmother’s sister, might just make Bea’s summer a lot more bearable. But any epic road trip is bound to have some bumps along the way. Three students are chosen to participate in the scavenger hunt of a lifetime. Winning could mean a scholarship that would make a lot of things better. When the three start the hunt they find themselves running around Chicago, chasing down leads, but the scavenger hunt may have more in store for the three than a simple scholarship. When orphan Elizabeth Somers is sent to the Winterhouse Hotel, she finds a lot of things charming, like the library. But as she continues to live at Winterhouse she stumbles upon secrets and she starts to think that maybe she’s connected to the house and it’s family in a way she can’t really explain. 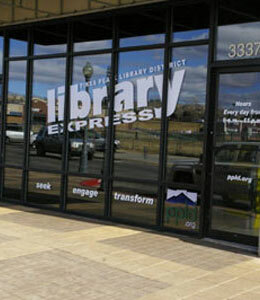 Pikes Peak Library District and Urban Peak Colorado Springs have launched a first-of-its-kind initiative in the state. 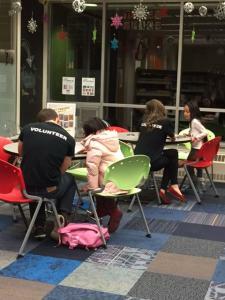 Aimed at helping teen runaways and youth experiencing homelessness to find help sooner, the project makes libraries in the District part of the National Safe Place Network. That help could include safe, temporary shelter, basic needs such as food or clothing, and potentially entering Urban Peak’s full range of services including counseling, healthcare, employment and housing services. A young person enters the library and asks for help. The library staff finds a comfortable place for the youth to wait while calling Urban Peak’s Safe Place Line: (719) 339-0509. Urban Peak dispatches a Safe Place trained volunteer to the library within 30 minutes. The volunteer will speak with the youth and then provide transportation to Urban Peak’s facility. Once at Urban Peak, counselors meet with the youth and provide support to see what’s needed. That could mean shelter, or getting the teen connected to next safe steps. Information about Safe Place will go out to local middle schools and high schools and other youth-serving organizations. 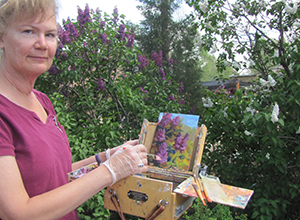 The ManitouSprings_Portal, presented by Imagination Celebration and PPLD, is located in front of the Manitou Art Center, Create Café, and Manitou Springs Heritage Center. 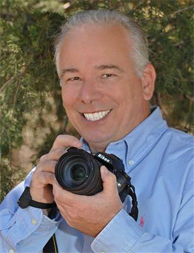 For current schedule and booking experiences, visit sharedstudios.com/pikes-peak. East Children's has a new giant magnet wall for kids! 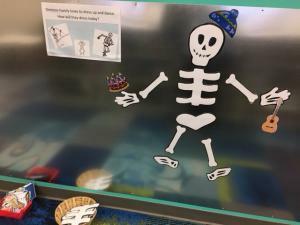 Come see if you can put the skeleton together and add accessories too. National Hispanic Heritage Month runs from September 15 to October 15, here are some great J-Fiction and Nonfiction for you to read. All six of these books can be found in our collection! Esperanza travels with her mother to the United States in the middle of the Great Depression, seeking opportunity after the death of her father. Not used to the hard labor of farming, Esperanza has to discover what it means to her herself in this new environment. Summer in Miami has never been so different for Arturo Zamora. A new girl in the apartment complex has captured his heart and he’s putting in some hard work at his family’s Cuban-American restaurant. When a land developer comes to town and threaten Abuela’s restaurant, Arturo Zamora is ready to fight for his family and community. When Sophie Brown and her family leave Los Angeles for her Uncle Jim’s Farm, she’s tasked with taking care of some unusual chickens. As a means to adjust, Sophie begins to write letters to her Uncle Jim and dear Abuelita about what it means to be a poultry farmer, and to be one of the few hispanic people in town. When two raccoons steal his sister’s tricycle, fourth grader Mateo is left to blame. In a quest to retrieve the trike from the thieving raccoon’s, Mateo discovers that they can talk! Can Mateo get the tricycle back and clear his good name, or with the talking raccoons have the last laugh? Featuring Latino people from different countries and backgrounds, this collection of poems celebrates the likes of Ceaser Chavez, Roberto Clemente, and librarian, Pura Belpré. José Guadalupe Posada was the brilliant mind behind the festive skeletons that would become known as Calaveras. This book covers his history and how he came to create the dancing skeletons that have become synonymous with Dia De Los Muertos. 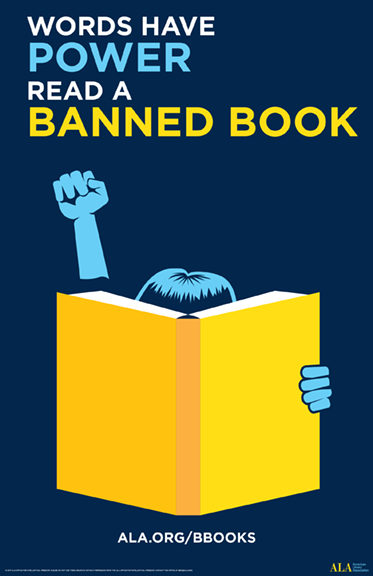 September 24 - 30 is Banned Book Week! Pick up a children's book that someone has tried to ban. In other words, the complaint was meant to rid the library of that particular title...forever! 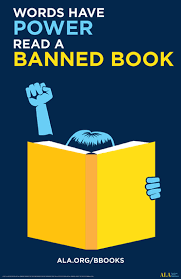 Go to http://www.ala.org/advocacy/bbooks/frequentlychallengedbooks/childrensbooks for a list of banned books and get reading! Study Buddies has begun for the school year! Teens have been specially trained to help elementary kids with their homework. 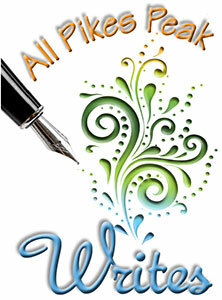 This program is held at the East Library every Tuesday evening, 6:30 pm to 8:00 pm. It's a drop-in program, so you'll be asked to sign your child in at our children's information desk. 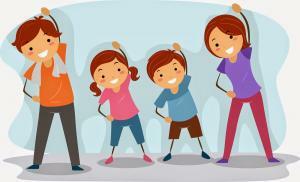 A volunteer will spend 20-30 minutes helping your child. Come check it out! Path to Citizenship classes are designed to assist individuals preparing for the U.S. citizenship exam. Classes are facilitated by volunteers and follow USCIS provided curriculum focused on American Government, History, and Integrated Civics. Path to Citizenship classes also provide individuals with an opportunity to improve their reading, writing, listening, and speaking skills as they relate to the citizenship test. 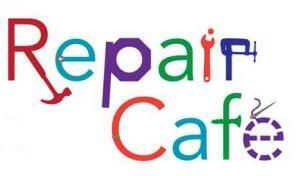 Saturdays from 10 a.m. - noon starting Sept. 16 at Crossing Church, 2323 E. Boulder St.
Wednesdays from 6:30 - 8:30 p.m. starting Sept. 13 at East Library, 5550 N. Union Blvd. Ravi Suryanarayanan calls himself “fresh off the boat”, in other words, he and his family have just moved to New Jersey from India. Ravi is starting 5th grade and is excited to show off his mastery of many skills, English and Math, to name two. EVERYTHING goes wrong for Ravi those first days in 5th grade. Meanwhile, Joe who sits behind Ravi, has his own set of problems that are just as mountain-sized as Ravi’s. The two boys move through their struggles as if moving up the opposite sides of the same circle. They meet at the top. 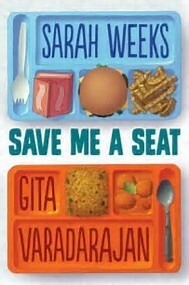 Save Me A Seat by Sarah Weeks and Gita Varadarajan is a powerful portrayal of overcoming bullies and cultural misunderstandings. In the end, acceptance wins out. On Wednesday, August 30, the Library Express facility at the First and Main Town Center will be permanently closed. The library material return drops will remain at that location indefinitely. Library Express items may be returned to any PPLD location, including the drops at First and Main. The decision to close Library Express was made because the limited usage it receives no longer justifies the cost and time of maintaining the facility. Library Express opened in in February 2011 to provide our patrons an access point on the busy Power Corridor. PPLD will continue to explore options for providing Library service to that area. The 2017 Teen Fiction Writing Contest Anthology is here! Compiled are the Honorable Mentions and Winners from the 2017 Teen Fiction Writing Contest. Click on the link to download and view! 2017 Teen Writing Contest Winners! A big thank you to all our participants, and congratulations to our winners! 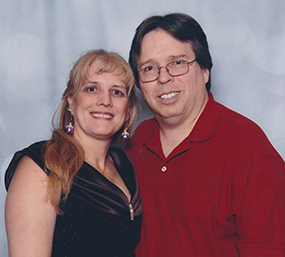 The winners were announced at the Award Ceremony on Thursday, July 27, after remarks from Evangeline Denmark. Winners were chosen by staff judges who read without knowing who wrote the pieces. The stories by the winners listed above will be compiled into a digital anthology that will be posted on the blog by the end of the month. 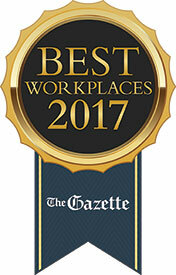 Please let rphilipsen@ppld.org know if you have any questions! PPLD Kids built incredible towers, bridges, and mazes! 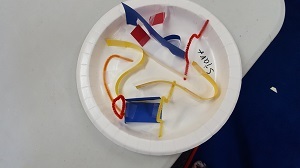 We designed our own marble mazes with paper plates. Next, using only 20 binder clips, 20 paper clips and 30 tongue depressors, we tested our mettle building the tallest tower and the strongest bridge. Our tallest tower was 13 inches and our strongest bridge held 16 books! This is definitely something you’ll want to try at home. Do you think you can beat Palmer Lake Library’s record?